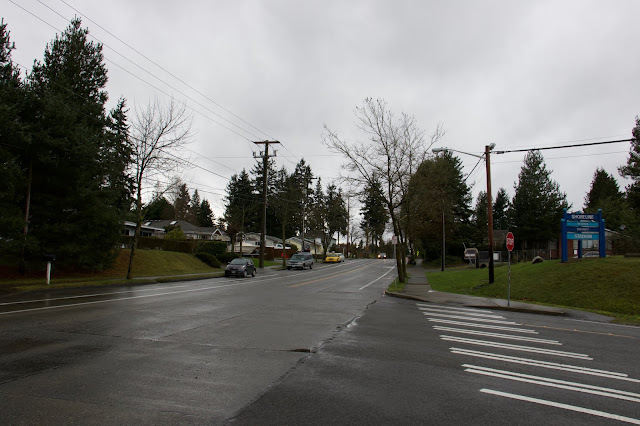 NE 185th St at 5th Ave NE, February 7, 2015. Dry Weather Ends: Wednesday morning is likely to be the last few hours of dry weather left in November. A weather system is approaching as our upper level ridge of high pressure moves east. The jet stream is shifting from the north in Alaska to the west coast and is expected to bring a series of storms with it. Wednesday there is a slight chance of rain in the morning, then rain is likely in the afternoon. We are expecting rain to continue through the evening switching over to showers after midnight. We could get between a quarter inch to a half inch of rain. High around 50°F with lows in the 40's. Thanksgiving Day, true to the Pacific Northwest tradition, will feature a moderate rain storm with high winds. Models have been a little inconsistent with how strong winds will be. Right now we are expecting winds of 20-30mph with gusts as high as 40mph. High temperatures will be in the low 50's with up to a half inch of rain. Thursday evening through Friday evening we are expecting to have rain continue at times, highs falling to the upper 40's and lows down to the mid 30's Friday night. We are expecting a bit of a break on Saturday with mostly sunny skies, temperatures near the upper 40's. We have a slight chance of rain Saturday night and Sunday. Monday the rain returns lasting through Tuesday and possibly further into next week, high temperatures reaching the lower 50's and lows in the 40's. Long range outlook: Officially we are heading into a moderate El Niño winter. Typically this means that we are expected to be above normal in temperatures and below normal in precipitation. For Shoreline and Lake Forest Park, look back to the 2014-2015 winter and the 2006-2007 winter as examples of what to expect. Overall it should be a fairly mild winter with more uneventful weather than normal. Snow chances are less likely; our best window for lowland accumulating snowfall is between December 15th and January 15th. Much of the weather beyond January 15th is expected to be too mild and dry for any snow threats. There could be a windstorm or two; chances are somewhat equal for those during an El Niño season. December will probably be our best month for active weather.